In this undated photo a man, believed to be the gunman who killed dozens at an Istanbul nightclub, films himself and the street behind him as he wanders nearby Istanbul's crowded Taksim square. Turkish media have broadcast a video of a man they say is the suspected gunman who killed 39 people during a New Year's attack on an Istanbul nightclub. The video appears to be from a cell phone the man is carrying as he walks around Istanbul's Taksim square. He spends much of the time looking into the camera, but does not speak. It is unclear when the video was recorded. Authorities had earlier released a grainy image of the suspected shooter taken from security camera footage. Turkish media also reported Tuesday that authorities detained two foreign nationals at Istanbul's Ataturk airport in connection with the attack. No other details were given. Turkey's Deputy Prime Minister Numan Kurtulmus told reporters Monday that eight other people had been detained. 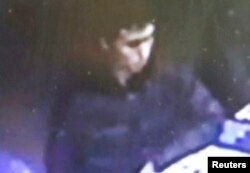 A Turkish police handout picture of a suspect in Istanbul nightclub attack which killed at least 39 people on New Year's Eve, made available Jan. 2, 2017. The attack began early Sunday with the gunman killing a police officer and a civilian outside the Reina nightclub before going inside. There were about 600 people, many of them foreigners, in the club at the time, some of whom jumped into the Bosphorus Strait in order to escape. Authorities said the shooter blended in with people leaving the club. In addition to those killed, about 70 people were injured. 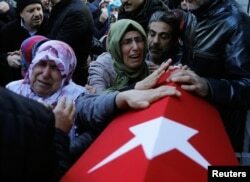 On Tuesday, U.S. President Barack Obama spoke by phone with Erdogan to express his condolences. The White House said the two leaders agreed that Turkey and the United States must continue to stand united in order to defeat terrorism. Obama also praised Turkey's ongoing efforts to work with regional players to facilitate a nationwide cease-fire in Syria and a return to political negotiations between the Syrian regime and the opposition. A police officer looks at the photographs of the victims as two others stand guard a day after an attack at a popular nightclub in Istanbul, Jan. 2, 2017. In a video released last week, Islamic State called on its supporters to launch attacks in Turkey. The video came against the backdrop of the Turkish military’s ongoing battle to wrest control of the strategically important Syrian town of al-Bab from the jihadist group. Citing security sources, Turkish media reported Monday the gunman in the nightclub attack is believed to have come from a Central Asian country, either Kyrgyzstan or Uzbekistan. Many Islamic State fighters are drawn from Central Asian countries and have used Istanbul as a base before traveling to fight in Syria. Local media, citing a police report, said that three days before the nightclub attack, 63 suspected Islamic State militants were detained across Turkey, including in Istanbul. The same report said many of those held were from foreign countries and that the same jihadist cell which carried out June’s attack on Istanbul’s Ataturk airport could be behind this latest deadly attack. Relatives of Fatih Cakmak, a security guard and a victim of an attack by a gunman at Reina nightclub, react during his funeral in Istanbul, Turkey, Jan. 2, 2017. Funerals are continuing for those killed in the New Year's attack, which was the fourth deadly IS attack in Istanbul in a year. For one unnamed mourner there was both anger and despair. “This is where words fail. What word, what sentence can depict this pain? After life is gone, the heart is gone. Terror is not only the problem of this country, it is the problem of every living person, but they just cannot find a solution,” the mourner said. 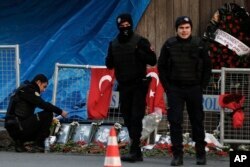 The PKK Kurdish rebel group has also carried out bombings in Turkey's main cities, including last month in Istanbul. The government has promised to step up security. But the security forces are struggling to cope with mass purges within their ranks after July’s failed coup attempt, which Turkey's government has blamed on followers of the Islamic cleric Fethullah Gulen.